Snowmaggedon, Snowpocalypse… you just haven’t lived life in the Northwest until you’ve experienced one of our snowstorms. Yes, they make fun of us on the national news, and it’s not without good reason. When it snows here, it is never “just snow”. It is rain, it is snow, it is ice. And you never know what you’re going to get. It messes the roads up, sometimes the power goes out, and quite often when one of these snow events starts, you have no idea how long it’s going to last. It’s best just to stay in your house, unless you absolutely, positively have to get out for some reason. Before the snow starts, you are wise to go to the store and stock up. Once it hits, you are even more wise to stay put. That said, maybe you got out and stocked up before the snow started messing everything up. Or maybe you didn’t. Or maybe it went on longer than you thought it would and now you are out of just about everything. Or, my Uber Eats loving reader (you know who you are), maybe you have never cooked a day in your life and you are getting plenty tired of that box of cereal. Whoever you may be, if you’ve got a can of beans and some pasta, I’ve got you covered. 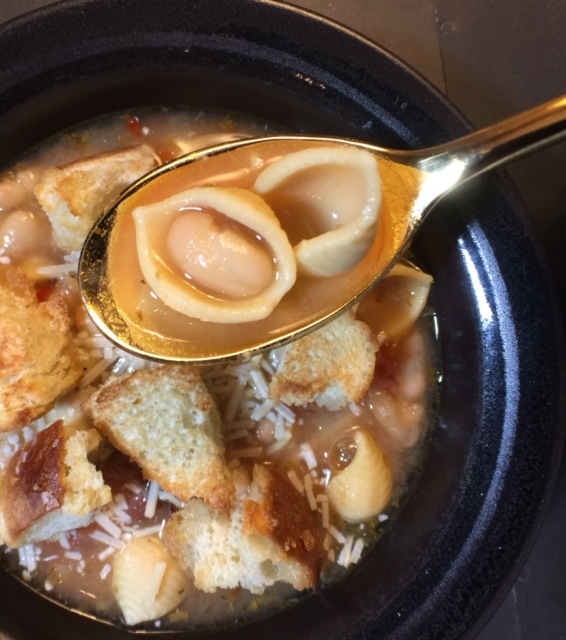 This Pasta Fagioli (Italian pasta and bean soup) is fast and easy to make. It cooks in one-pot and is just what you need to chase the chill on a cold, wintry day. Best of all, the ingredient list is small and simple, and you hopefully have everything you need right in your house, so there’s no need to leave. This was one of my grandfather’s favorite recipes. Simple, flavorful, and filling, it was always served with a generous topping of some freshly grated cheese and always accompanied by some warm, home made, baked bread. There were 2 cans of tomatoes called for in the original recipe, but I reduced it to about half of one can, which is more like the way I remember my grandfather making it. You can use bacon in place of the pancetta. If you don’t have canned tomatoes, you can substitute diced, fresh tomatoes, just let them cook a little longer. As for the pasta, use what you have. Elbows, shells, or any smallish variety would work here. The original recipe called for ditalini pasta, but I used Banza shells, made from chickpeas, to keep this gluten-free. You could also change out the beans. Chickpeas would work nicely, but there’s no reason pinto beans couldn’t be a possibility. Want to make this vegan? Skip the pancetta, use vegetable broth and go more heavy-handed on the spices. In this case, I would also add another can of beans, pureed in the blender with their liquid, to give the soup more body and flavor. While the soup cooks, make the Garlic Bread Bites. You can use any kind of bakery bread: French, Italian, sourdough, or focaccia to make these toasty croutons. If you don’t want your croutons to be spicy, omit the red pepper flakes. Store any that you have left over, tightly covered. You can use them to top salads or as a snack. If you’re not making croutons, wrap some bread lightly in aluminum foil and heat it in the oven while you make your soup. Stay safe. Stay warm. Cook what you have and stay in. Preheat oven to 375º F. Line a baking sheet with parchment paper and spread bread chunks evenly onto tray. Bake until golden and lightly toasted, crispy on the outside, but still somewhat soft and chewy. Add olive oil to a large stockpot and cook the pancetta or bacon over medium-high heat, stirring occasionally the fat is rendered, about 5 minutes. Add onion and a pinch of salt and continue to cook until softened, stirring occasionally, about 7 more minutes. Add garlic, oregano, and crushed red pepper. Cook and stir until fragrant, about 2 more minutes. Add wine and cook, stirring, until wine is nearly absorbed. Add chicken stock or bouillon and tomatoes and bring to a boil over high heat. Stir in pasta and reduce heat to moderate, simmering and stirring occasionally until the pasta is al dente, about 10 minutes. While pasta cooks, make garlic bread bites. Add peeled garlic cloves to a quart sized zip-top bag along with a generous pinch of salt. Use a rolling pin to smash the garlic into a thick paste. Empty contents of bag into a medium bowl and add olive oil, melted butter, and red pepper flakes, if desired. Add warm croutons, tossing gently to lightly coat. Transfer to baking sheet and spread evenly. Return to oven for just a few minutes more until fragrantly toasted and golden. Stir beans into soup and simmer for about 5 minutes. Taste and adjust seasonings with salt, pepper, and additional red pepper flakes, if desired. Ladle into bowls and top with freshly grated cheese and garlic bread bites, or serve with crusty bread.